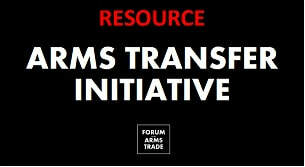 The Forum on the Arms Trade is a network of civil society experts and a point of contact for strengthening public efforts to address the humanitarian, economic and other implications of arms transfers, security assistance, and weapons use. Managed from Washington DC, the Forum provides a venue for bringing its community's wide-ranging expertise together to amplify and strengthen its work, while also offering government and media members a one-stop resource for the latest information, analysis, and best contacts. Forum-listed experts are located around the world and work on diverse topics including human rights, development, arms control, humanitarian disarmament, cybersecurity, arms and the environment, anti-corruption, and related fields. UPDATE - A hearing on this topic is was held Tuesday, March 26, in the House Foreign Affairs Subcommittee on Oversight and Investigations. 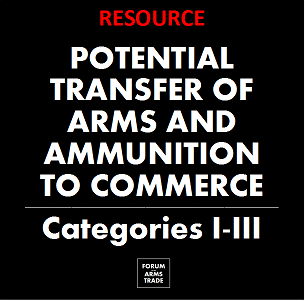 On February 4, 2019, Congress was notified of final rules to transfer of some items on US Munitions List (USML) categories I-III to the Commerce Control List (CCL), starting a 30-day review period. Legislation to block the change has now been introduced in both the Senate and the House and a hold placed. ​The proposed rule was published on May 24 and closed for public comment on July 9, 2018. See resource for concerns expressed and more information. Audio and additional information available here from briefing with Representatives Torres and McGovern and other experts on March 5. 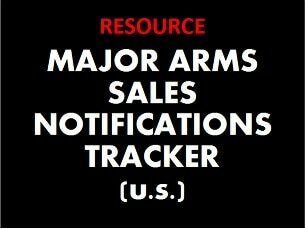 Tracking select legislation related to arms trade, security assistance, and military support. See resource page. Revised implementation fact sheet released on Nov 8 by the U.S. Department of State. Find it on our updated resource page. ​Highlighting publications in which Forum-listed experts were involved. Inclusion on the Forum on the Arms Trade expert list does not indicate agreement with or endorsement of the opinions of others. Kate Kizer, "Congress Demands End to Yemen War: Now What? ", Lobelog, April 10, 2019. ​William Hartung and Christina Arabia, "Trends in Major U.S. Arms Sales in 2018: The Trump Record - Rhetoric Versus Reality," Center for International Policy, April 2019. Iain Overton, "The Price of Paradise," Quercus, April 2019. Nils Duquet, "The 2018 EU SALW Strategy: Towards an Integrated and Comprehensive Approach," No. 62, EU Non-Proliferation and Disarmament Paper, April 2019. Daniel Mahanty and Alex Moorehead, "Costs of War Can’t Be Assessed Without Official Civilian Casualty Estimates" Just Security, April 3, 2019. Allison Pytlak, “It's time to get serious about gender-based violence,” ATT Monitor, Reaching Critical Will, Vol. 12, No. 2, April 2, 2019. N.R. Jenzen-Jones (editor), "Field Guide No.2: Introduction to Photogrammetry," Armament Research Services, April 2, 2019. John Lindsay Poland +, “Human Rights and Legal Arms Exports: The United States and Germany in Light of the Crisis in Mexico,” Vol LIX, 2, Foro Internacional, April-June 2019. Jeff Abramson, “U.S, Saudi Arms Transfers Top Global Trade," and “Congress Acts on War in Yemen,” Arms Control Today, April 2019. William Hartung, "Pentagon Spending is a Poor Job Creator," The Nation, March 22 2019. Ray Acheson, “It’s Time to Exercise Human Control Over the CCW,” (No. 2), “Will the ‘Insignificant States’ Please Stand Up,” (No. 3), CCW Report, Reaching Critical Will, Vol. 7, March 2019. Erin Hunt, “Autonomous Weapons, Ethical AI, and Feminist Foreign Policy,” CCW Report, Reaching Critical Will, Vol. 7, No. 2, March 2019. Mary Wareham, “Time to Get Serious Before It’s Too Late,” CCW Report, Reaching Critical Will, Vol. 7, No. 1, March 2019. ​Allison Pytlak, “Getting There, One Way or Another,” CCW Report, Reaching Critical Will, Vol. 7, No. 1, March 2019. William Hartung, “Pentagon Spending Is a Poor Job Creator,” The Nation, March 22, 2019. Iain Overton +, "RAF claims 4,315 enemies killed and injured in Syria and Iraq, with just one civilian casualty" Action on Armed Violence (AOAV), March 7, 2019. Aude Fleurant +, "Trends in International Arms Transfers, 2018," SIPRI, March 2019. Jeff Abramson, "U.S. Firearms Export Changes Meet Challenges," Arms Control Today, March 2019. Daniel Mack +, "Taming the Devil within: How to use the Arms Trade Treaty to Address Diversion in Latin America," Control Arms, Feb. 26. 2019. William Hartung, "Is the United Arab Emirates Really Our Friend?" LobeLog, Feb. 21. 2019. Jeff Abramson, "Congress should block rule changes for firearm exports," The Hill, Feb.20, 2019. View the full list of recent and past publications featuring Forum on the Arms Trade-listed experts. UPDATED: House approves Yemen War Powers resolution (the version from the Senate) on April 4, and President Trump issued a veto on April 16. On March 13, the Senate passed their version of the resolution, S. J. Res 7. On February 13, 2019, the House passed H.J. Res 37 "Directing the removal of United States Armed Forces from hostilities in the Republic of Yemen that have not been authorized by Congress." See resource. 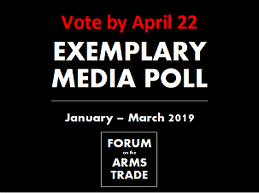 Vote by noon (EDT) April 22 in our quarterly poll identifying exemplary reporting on arms trade, security assistance and weapons use issues. 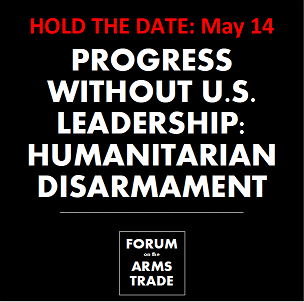 On May 14, the Forum will host an event in Washington DC examining humanitarian disarmament. RSVP now. See transcripts and more details here. 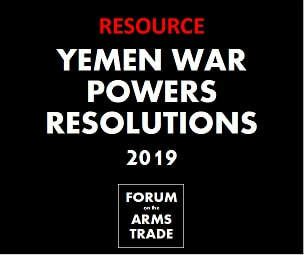 Forum-listed experts examine issues in 2019 related to weapons use, the arms trade, and security assistance. other partners, listed experts, or resources produced by the Forum.